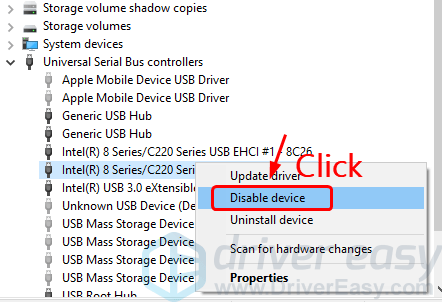 Driver Easy fixes your USB device not recognized problem instantly! 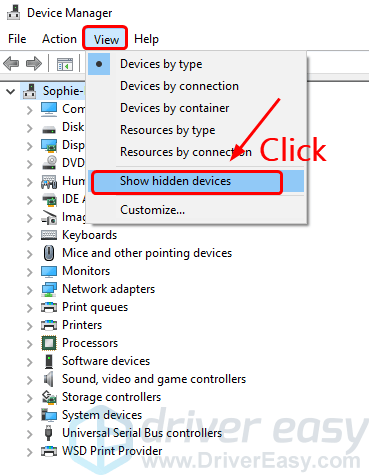 USB device not recognized – The last USB device you connected to this computer malfunctioned, and Windows does not recognize it. making it impossible for you to do whatever you want to do, you’re not alone. Many Windows 10 users are reporting this as well. But no worries, this problem is not that hard to fix at all. If you’re not interested in the cause of this problem, jump ahead to the fixes. Why would I see this problem? The exact cause to this problem varies on different combinations of computer environments. It could be caused by malfunctioned USB ports, USB controllers bugs, or outdated, missing or faulty USB ports. As mentioned, the exact cause could be very different in different situations, but there are some general resolutions that you should try before you turn to technicians. And one of the solutions below is bound to fix the problem for you. No worries, we’ve got you covered. Here are 4 solutions for you to try. You may not have to try them all; just work your way down until you find the one works for you. If you are with a desktop, try to connect your USB device to your computer via the USB ports at the back of your computer case. The USB ports at the back usually have stronger electricity power coming through, which will allow a more stable power supply to your USB device. If you are with a laptop, try unplugging your USB device from its current port and plug it into a different one. Try not to use any USB hubs. If your problem stops here, the USB port might be at fault, not your USB flash drive. Try to avoid using the same port next time, in case similar problem happens again. Another possibility for your not-recognized USB device is outdated, missing and/or faulty drivers. 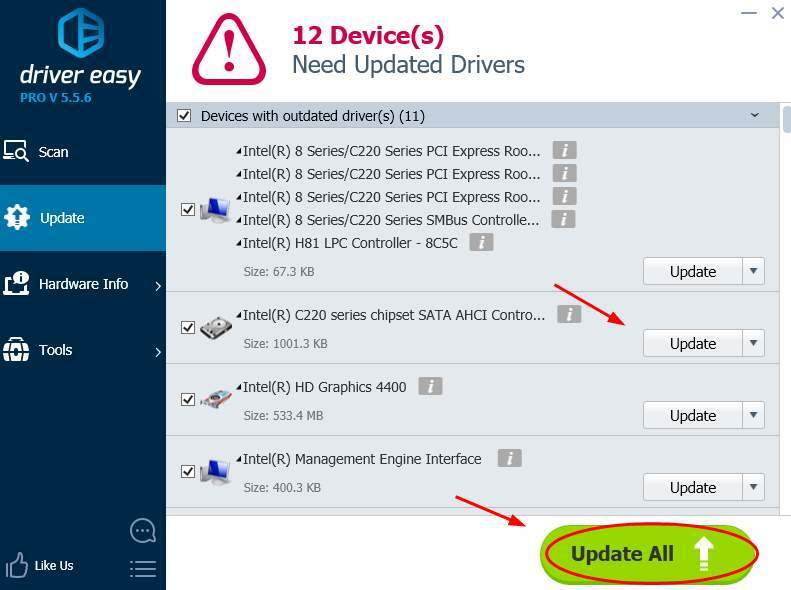 You should verify that all your devices have the right drivers, and update those that don’t. This is especially true for your motherboard driver, your USB port drivers, and your external hard drive driver. 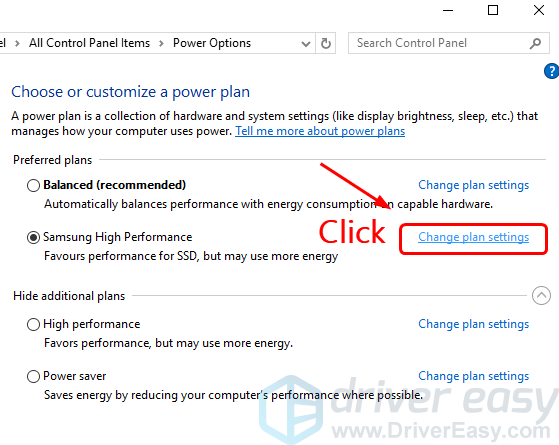 Manual drivers update – You can try to update needed device drivers via the Device Manager one by one, or Windows Update if you’re on Windows 10. 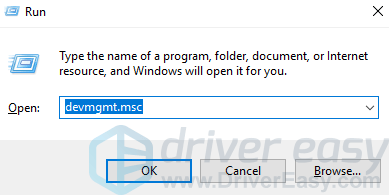 If Windows Update or Device Manager fails to locate the appropriate drivers for you, you can also go to the manufacturer support website and search for the device drivers by yourself. The process could take quite some time if you’re not particularly familiar with the driver update process. 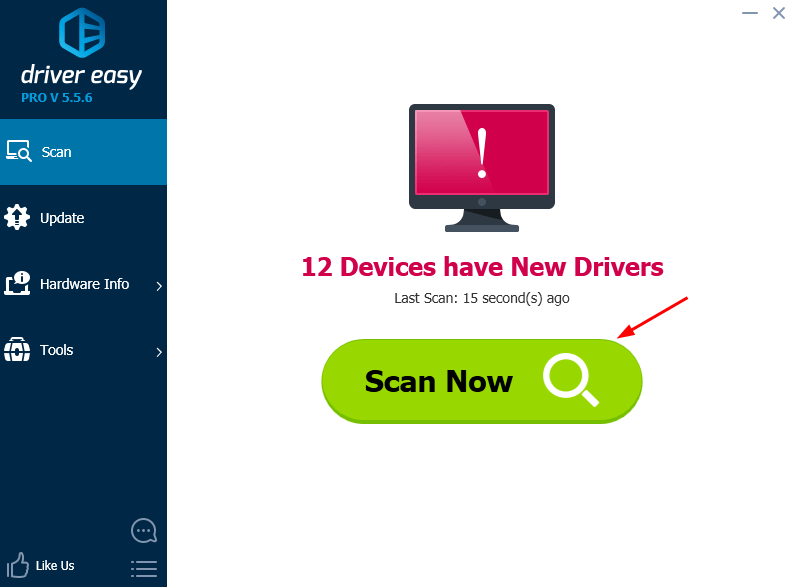 3) Click the Update button next to the flagged drivers to automatically download and install the correct versions (you can do this with the FREE version). 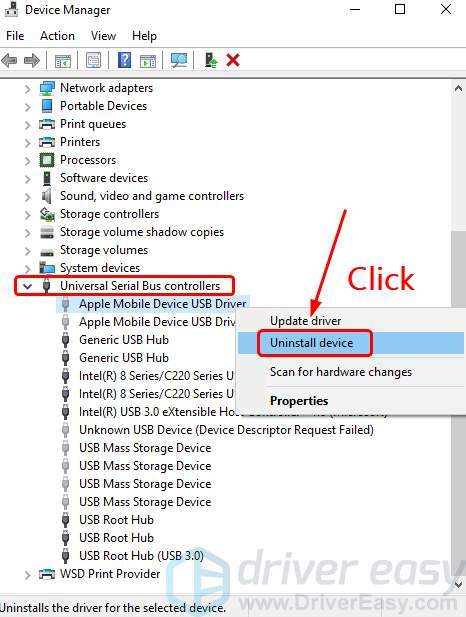 4) You need to restart your PC for the updated drivers to work properly. Check if your USB device is recognized now. Selective suspend is a feature allowing your computer to assign certain USB ports to a power saving mode, just like the sleep mode of your PC. It’s very handy when you are only on battery with your laptop or tablet. 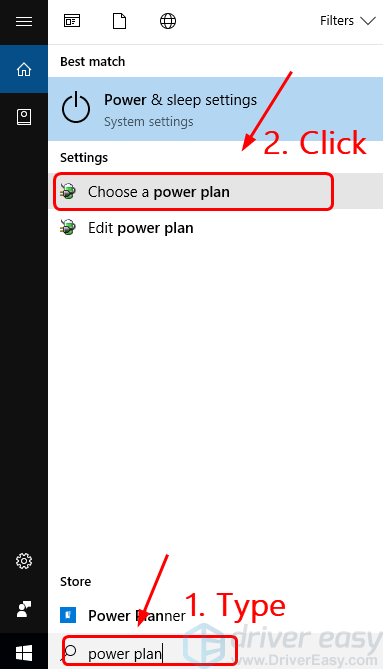 1) On your keyboard, press the Windows logo key and S at the same time, type in the search box power plan and click Choose a power plan. 2) Click Change plan settings next to the plan option you’re having now. 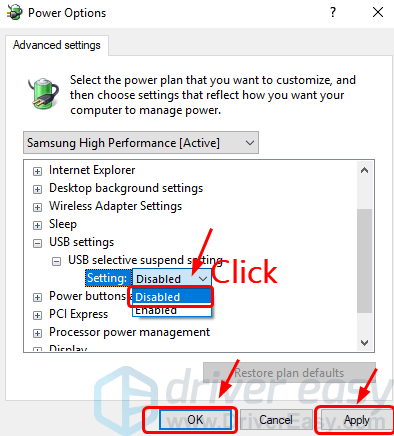 3) Click Change advanced power settings. 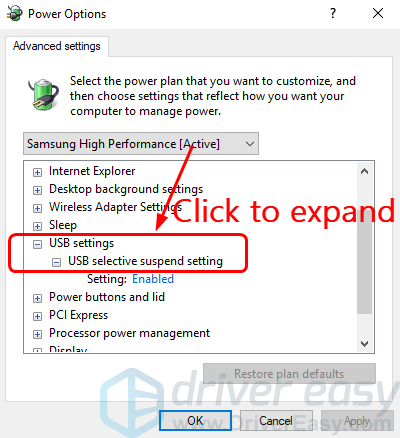 4) Click to expand USB settings and USB selective suspend setting. 5) Select Disabled from the drop-down option. Then click Apply and OK to save the change. NOTE: If you’re using a laptop, click On battery, then Disabled from the drop-down menu. 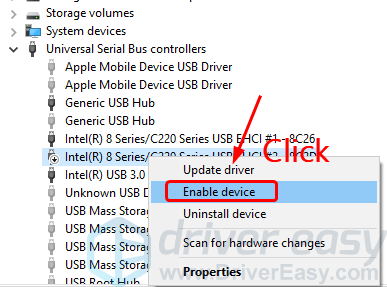 6) Check to see if your USB device is recognized now. If the problem remains unsolved, proceed with the methods below. 1) On your keyboard, press the Windows logo key and R at the same time. Type devmgmt.msc in and press Enter. 2) On the top bar, click View and then Show hidden devices. 3) Click to expand Universal Serial Bus controllers. 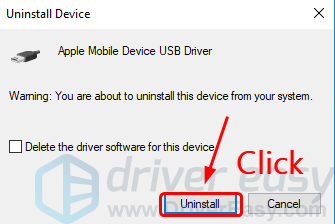 3.1.1) Right-click them and click Uninstall device. 3.1.2) Click Uninstall to continue. 3.1.3) When the uninstall finishes, restart your computer. Then repeat the same procedure with the rest of the USB controllers marked by yellow exclamation marks or question marks one by one. 3.2.1) Right-click the first option you see here and click Disable device. 3.2.3) When the disable finishes, restart your PC. Repeat the same procedure as above, and if your USB controller driver is not enabled automatically, right-click it and click Enable device. 4) Your USB device should be recognized now.